The Executive Chairman’s presentation at the Annual General Meeting was divided into three sections. First, he briefly went over the macroeconomic environment and the outlook for 2017. Then, he described the 2016 results. And finally he commented on the biggest milestones in BBVA’s strategy. Regarding the global scenario, he noted that estimates put global growth at 3.2 percent in 2017, slightly higher than 2016 (3 percent), but with a downside risk linked to political uncertainty. The Group Executive Chairman then went on to discuss some of the bank’s financials. “2016 was a very good year for BBVA. In a complex environment, our profit increased by almost 32 percent, we’ve bolstered our risk profile and strengthened our capital base,” he noted. This result relied on “income growth, our cost-containment efforts and lower impairment losses on financial assets,” he reported. 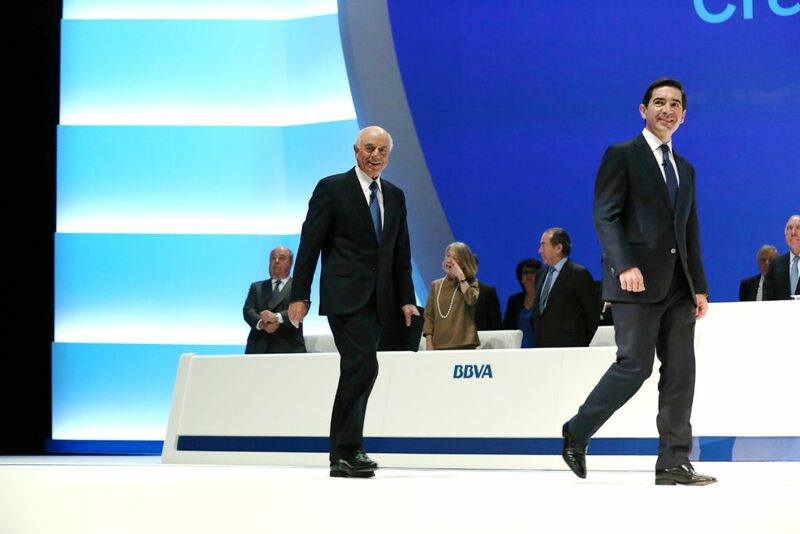 The final part of his presentation focused on BBVA’s strategy. “In 2016 we took some very relevant steps that have translated into tangible figures,” said Francisco González. BBVA is on its way to becoming “a new digital company, combining the soundness and power of a major global bank with a startup’s flexibility, efficiency, creativity and innovation skills,” he explained. In 2006, the bank’s platform processed 90 million transactions per day. It currently manages more than 1 billion on many days. New digital products with new and enhanced functionalities, making them easier to use and more convenient for our customers. BBVA Wallet, STEP, BBVA API Market, Commerce 360, BBVA Bancomer digital account, BBVA Valora and BBVA Trader were some of the products he mentioned. At the end of December 2016, BBVA had 18.4 million digital customers (50 percent more compared to 2014) and 12.4 mobile customers (more than twice as many as two years ago). Digital sales are showing strong growth across all regions. In Spain, for example, they accounted for 17 percent in December 2016 – more than double the amount from a year ago. 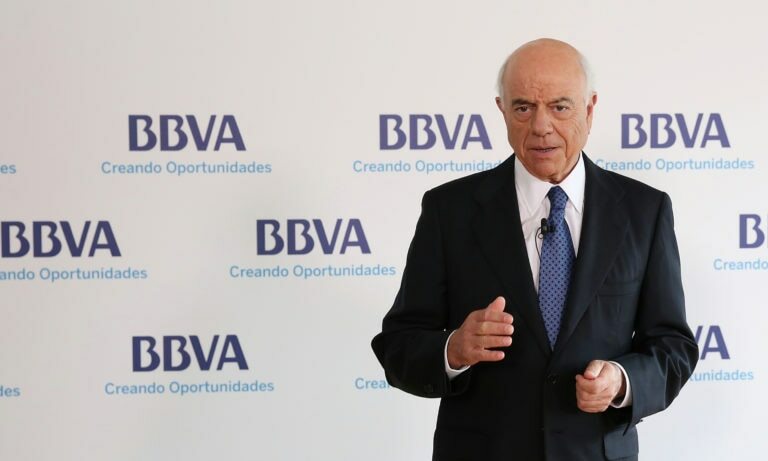 BBVA’s Executive Chairman also said that the “digital transformation is having a very positive impact on how customers perceive both BBVA and the service we provide.” More than anything, they value simplicity, convenience, efficiency, swiftness and usefulness, in addition to employees’ polite and helpful attitude. He also reminded shareholders that, in accordance with the policy announced in October 2013, BBVA intends to distribute between 35 percent and 40 percent of profits in dividend payouts, with a 100 percent cash dividend policy. A final Dividend Option scheme, of about €0.13 per share, will be paid in April 2017, once approved by the Annual General Meeting and the Board of Directors. Going forward, the dividend will be two payouts per year, tentatively in October and April of the following year. “Dividends will increase in parallel to results, in a very clear, sustainable and predictable way, aligned with regulator recommendations and best practices,” said Francisco González. 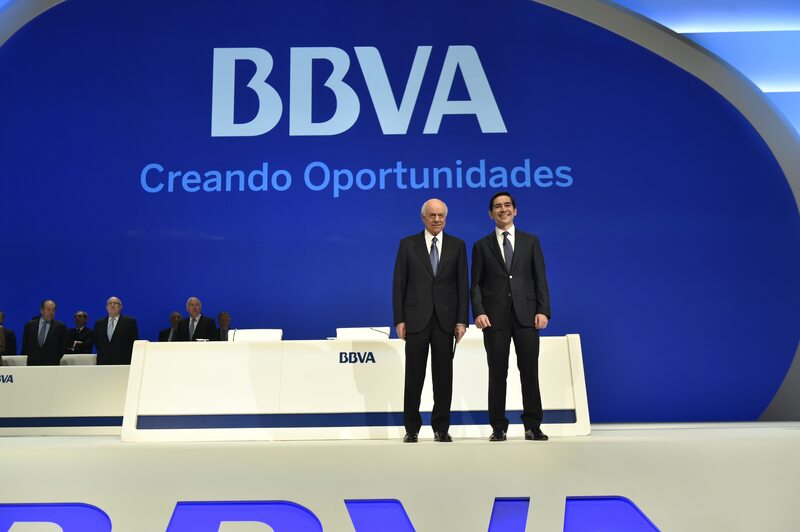 The Chairman then gave the floor to CEO Carlos Torres Vila who began his address explaining BBVA’s new purpose: to bring the age of opportunity to everyone, in other words, to have a positive impact on people’s and businesses’ lives. 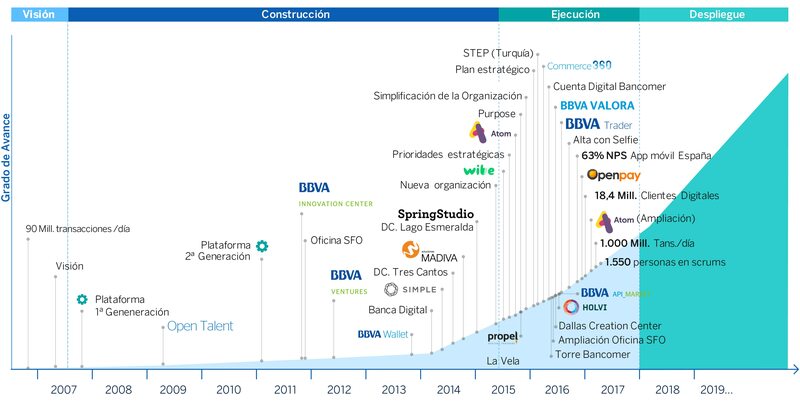 In second place, BBVA is increasing the number of customers who bank through digital channels. Mobile customers engage more frequently with the bank and report higher levels of satisfaction, he stressed. The third progress has to do with new business models, that is, reinventing the way of doing banking the same way new companies do. For example, the acquisition of disruptive companies such as Simple,Holvi or Openpay, and the investment in Atom. BBVA’s fourth priority is its solid capital position. At the end of 2016, the company’s fully-loaded CET1 stood at 10.9 percent. The fifth goal is unrivaled efficiency, focusing on cost-containment efforts across all regions. The CEO then offered an overview of the highlights in each business area. Regarding banking activity in Spain, he mentioned the impact on income as a result of the negative interest rate scenario, lower activity in mortgages and the public sector, the positive evolution of cost-containment efforts and impairment losses on financial assets, the impact of floor clauses on results and the improvement of risk indicators. As for real estate activity in Spain, the CEO noted the significant reduction in real estate exposure, the improvement of asset coverage and improved market dynamics in 2017. In the U.S. performance “improved as the year advanced,” said Carlos Torres Vila. The area focused on profitable growth and cost containment efforts. Oil prices recovered and we released some provisions. He also noted that the outlook for 2017 is positive, thanks to BBVA Compass’ positive sensitivity to interest rates increases. In Mexico, he noted that BBVA Bancomer remains the undisputed market leader, continues to grow its market share in loans and is the most efficient and profitable bank, with a solid capital position. The franchise posted “stellar results,” he said. In Turkey, he noted that 2016 had been “an outstanding year”, with solid income growth driven by sound pricing policies and solid activity levels. “Garanti is without a doubt the best franchise in the country. Despite the current uncertainty, the country’s growth potential is outstanding,” he said. In South America, he underscored the double-digit growth in recurring revenues,despite a slight slowdown in activity resulting from macroeconomic conditions. In 2017 “we expect solid results despite uncertainties” thanks to the macroeconomic recovery in the countries where the Group operates.